Bulgaria is not famous for its islands like Greece for instance, but there are a few situated on the Bulgarian Black Sea. Maybe you won't believe it, but believe me, they are worth the check. After the popularity of St. Anastasia Island, this year I visited the less popular and much wilder island, Saint Ivan. If you are going to Sozopol this summer and you want to try something different, here’s why you should consider going there. We were in Sozopol chatting over a cup of coffee. Lying on the beach was not included in our daily plans so we decided to make a tour to the island, which is situated very close to the city. We headed to the marina where our future sailor was waiting for us. We hopped into his boat and sailed away. We left Sozopol left behind our backs but it was one of the prettiest views with its red rooftop houses in contrast with the turquoise waters throughout the Black Sea and the blue skies above. We saw in the distance the golden sands of Gradina beach as well. 20min later we reached the northern port of the island and we were greeted by the local inhabitants - wild island goats. We climbed the stairs that took us to the top where a 360 degrees view was waiting for us. We headed towards the lighthouse. We walked the path but at some point, the grass was already covering our ankles, so we had to evaluate our steps. We passed the lighthouse and we reached the remains of the medieval monastery Saint Ivan Precursor. In 2010 prof. Kazimir Popkonstantinov made major archaeological finds. Fragments of remains, probably of St. John the Baptist were discovered. Saint Ivan’s Island is a home of the Audouin’s Gull, Caspian Gull, European Herring Gull, as well as European rabbit. Unfortunately, we didn’t meet any rabbits that day. Saint Ivan is the biggest island in the Bulgarian Black Sea. Right next to it is situated the smaller island, Saint Peter. Probably both were separated from each other in the past. 2 hours later, it was already time to go back to the boat and leave the island. - Don’t forget the sunscreen. Here it is a must. This island is very intriguing to me. At the earliest opportunity - we will visit it. Thanks. I strongly recommend visiting it before it gets popular. I would have liked to see the goats! Everything is so blue and beautiful. Haha, they were just standing there looking at us :D Thanks, Anouk! You're right, Ivonne:) Yes, Saint Ivan Island is not popular at all so I am not surprised you haven't heard about it. Everything is so blue , so green and so sunny! Thank you for your kind words, Helena! 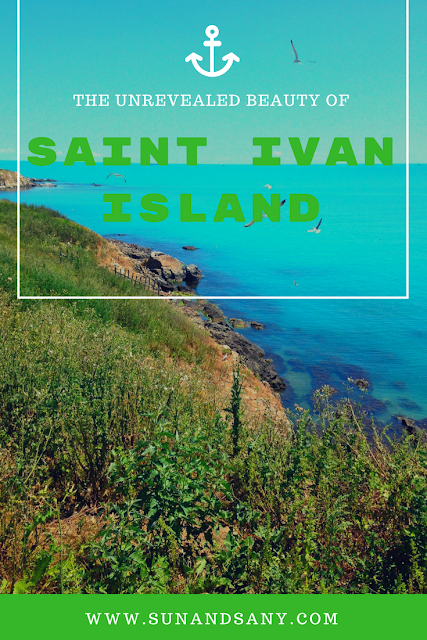 Saint Ivan Island certainly looks like it is full of charms. And it looks beautiful both from a distance as well as when you were on it. Unspoiled nature is a marvel to behold and it seems like you visited on a picture perfect day. Hope all is well Sany! Have a lovely month of July! I agree with you, Rowena. It's an interesting place with unspoiled nature. Thanks for stopping by! Wow look at that water! It's funny, I'm not familiar with all the islands off the European coast but I've always believed that they were on par with the famous Greek ones. This proves it! Hahaha! Beautiful photos S! Wow the sea is so blue and pretty. I can't believe an island like that exists in Bulgaria. We should definitely popularize it a lot more because it's so beautiful and more people should visit.